With around 200 million active users today, Pinterest has become an increasingly popular platform, particularly within the education community. So, to ensure you’re not missing out on all it has to offer, we’ve put together this guide on how you can use Pinterest to benefit you as a teacher. Do you sometimes struggle to come up with fresh ways to engage your students? Or maybe you have so many exciting ideas that it’s hard to keep track of them? Why not make Pinterest your go-to hub for storing teaching ideas, lesson plans and classroom activities! By creating different boards, you can group your own ideas into categories that work for you, as well as collate and store endless content and free resources shared by other teachers. By updating your settings to reflect your interests and following relevant accounts like our SAGE Education one, you can browse curated content and keep up-to-date with the latest teaching trends and hot topics in education. Pinterest is also a great way of collaborating with other teachers on projects or ideas as you can create shared boards for multiple users to feed in to. Whether you could do with daily guidance on improving your practice or support to help you make that next step in your career, Pinterest is a valuable source of CPD. It creates a centralised platform leading to different types of resources that can aid your continued professional development, such as free reading, recommendations and offers. You can search with keywords or specific hashtags if you’re looking to learn more around a certain topic. Pinterest is full of inspiring content to motivate you throughout the working day, such as positive quotes, creative ideas and new ways to challenge yourself. Find out what inspires you to be the best teacher you can be and create a board that you can refer to when you need some extra motivation. Our Education quotes board might be a good starting point! Pinterest is a great place to go when you’re feeling overwhelmed. Not only because it’s abundant with advice on mental health, mindfulness and work-life balance, but also because you can have as many different boards as you like. This means that not all of your content needs to be teaching-related and you can dedicate a board or two to whatever it is that helps you wind down. Whether it be travel, home décor or food, Pinterest has something for everyone and the act of pinning is perfect therapy after a long day! 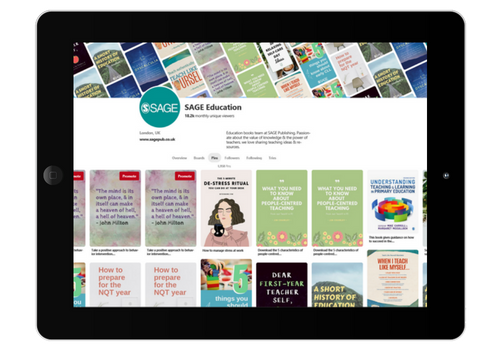 To keep up-to-date with our favourite teaching ideas, latest resources and inspiration, check out the SAGE Education Pinterest channel!